Clay Aiken!! Where Are You?? The following picture from SueReu tells it all. No words are necessary!! I hope Clay Aiken is resting and preparing for the next phase of his career!! Cute graphic and we can certainly speculate where Clay Aiken is!!! Maybe anyplace!! Where are you Clay? We miss you, and we’re anxiously waiting to see what’s up. I am SO ready for whatever it is he has in store for us. awww Anna you are so right, he is in our hearts and minds. Sure would like to see him again real soon. Ditto, Anna! And wherever he is, I just hope he’s having a good rest and peace. Cute Sue! You are very talented. As soon as someone finds Clay Aiken, let the rest of us know..OK??!! Shouldn’t something for UNICEF be coming up soon ? I just found Clay Aiken on my screen and in my earphones… I don’t really know what to make of it, because he’s messing up my working schedule… the pretty little thing he is…. and I really need to get my stuff done, otherwise I’ll end up in trouble. Get out of my head, Clay! Awwwww! I think that he is enjoying his time with his cutie-pie little son. Wherever he is…I hope he is enjoying some peace and quiet for a change. But, we’ll be right here waiting when he decides to come back and entertain us. 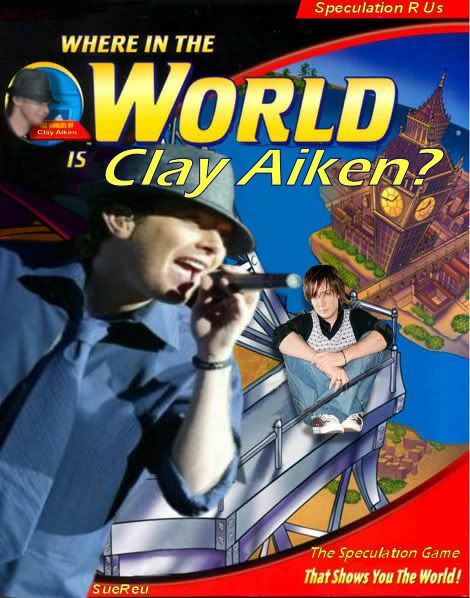 Where in the world is Clay Aiken? Why he is right here in my heart… and he’s in my computer and he’s in my iPod and in my car….he is with me where ever I go!! Seriously, I hope that where ever he is, Parker is there, too. Hope he is enjoying being a father while we all wait patiently for whatever is next. I hope that where ever he is, that he is doing well!! Me too, hope he is having fun with is son Parker. and thinking of us…we are right here waiting. Where is he? We are all Right Here Waiting for Clay Aiken. Error: Error validating access token: Session has expired on Tuesday, 21-Aug-18 16:13:01 PDT. The current time is Friday, 19-Apr-19 05:53:45 PDT.